This is the second of a two-part post talking preservation and sustainability with Chef Brendan McGill of Hitchcock Restaurant on Bainbridge Island, Washington State. Preservation, or what I like to call “pre-refrigeration food storage,” is at the heart of much of what we do at Hitchcock, and it touches every food group at the restaurant from meats to vegetables, dairy, and fruit. 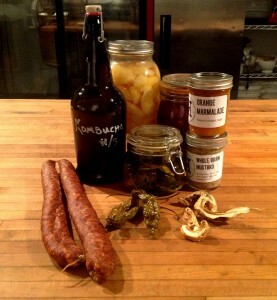 So many culinary concepts—cheese, vinegar, pickles, confit, cured meats, and alcohol—were derived from this necessity. As an offshoot of our kombucha program (a popular item at our next door deli, and fun for using to steam shellfish), we began to ferment our own vinegars. We start with an organic Columbia Valley blended red wine, and after a few generations, we can say the starter is our own. It’s a rich, fresh vinegar that makes an excellent mignonette for our oysters. The next elaboration we have planned is to hollow out a cured piece of applewood and torch it like a burnt cask, fill it with vinegar, and allow to age. We receive a weekly delivery of raw cow and goat’s milk from small local dairies, which we sell at our deli. As soon as we see them getting close to their expiration, we take them into the restaurant kitchen where they make excellent cheeses. Because they haven’t been pasteurized, their natural enzymes curdle the milk when heated without any added citrus or rennet. With these curds, we pull mozzarella, whip up ricotta, or press the ricotta into a “salata” cheese. We’ve had a batch of creme fraiche running for over 2 1/2 years; it started with our organic heavy cream, inoculated with buttermilk culture, which soured over 48 hours at room temp. We then refrigerate it, and use the cream in everything from potato salad to ice cream. When we get down to a few cups, we heat up another gallon of cream and inoculate that with the remainder. The whey that is an inevitable by-product of the whole milk is used to ferment our own whole-grain mustard, which gets a buttery flavor from the slow lactic fermentation that follows its preparation. 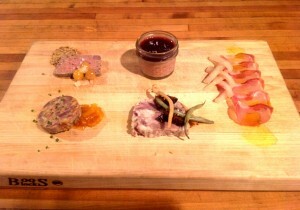 Of course, our charcuterie program is a great example of our preservation efforts. Cuts of pork are processed into bacon, dry-cured sausages, pancetta, lonza, prosciutto, and head cheese. Some of these, we’ll enjoy over a year after slaughter; a brilliant extension of piggy’s life. The fruit from the orchard on our farm undergoes the same preservation efforts. We turned over 50 lbs. of pineapple quince into 75 lbs. of carne de membrillo, which we use to garnish cheeses and show up in desserts and alongside foie gras all year. Apples became applesauce and figs were pickled. We also preserved the ground cherries that we bought from Sol Farm. We saved the pith from Eastern Washington watermelons and pickled them. After a few months, we have a citrusy, translucent fruit that few people can identify, and are always surprised to see in January at a Western Washington farm-to-table restaurant. Since we opened on this island a few years ago, we’ve developed an intimate knowledge of how the seasons roll around here. The bumper crop of sweet and hot peppers on the island inspired us to pickle large amounts two seasons ago, and we made hot sauce in our wood-fired oven from these house-pickled peppers right up until the last crop became available. Tani Creek Farm provided us with a selection of hot peppers, and we’ll never use those dried chili flakes from god-knows-where again. This year, we use some of the hot peppers, along with our dried sole roe, to make a kimchi-style ferment for hardy greens and cabbages. We also invested in a 22-quart hand-turned Polish crock, in which we can ferment 35 lbs. of local, organic cabbage from Laughing Crow Farm. This tangy, fizzy kraut was a game-changer, and allowed us to prepare a classic “choucroute garni,” with our kraut cooked in goose fat rendered from the local whole animals we receive, garnished with our pork charcuteries, and accompanied with our own fermented mustard.